Sarah Veblen is a custom fashion designer who focuses on creating clothing for her clientele and on teaching and writing to promote the craft of garment-making. For more than 25 years, Sarah has been designing and making clothing for her private clientele, specializing in fit, innovative pattern design, and quality construction. Her focus is on helping women create a wardrobe that is comfortable and compatible with their lifestyle. Dedicated to promoting sewing at all levels, Sarah enjoys immersing herself into her students’ learning process. She teaches in her studio and other classroom venues, as well as online through PatternReview.com. She is also a frequent guest lecturer and regularly holds workshops for sewing groups and organizations across the country. 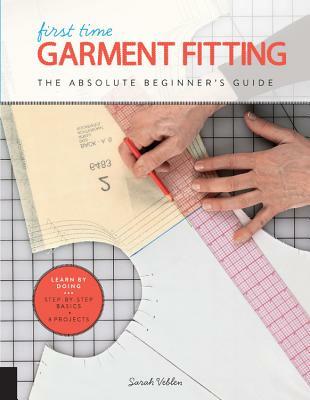 Sarah has authored many articles and publications on sewing and design, including her books First Time Garment Fitting and The Complete Photo Guide to Perfect Fitting and writes her own blog. She has also made a series of instructional fitting DVDs, produced by Threads magazine, on skirt and bodice fitting and on making stylistic changes to a pattern. Sarah has a Certificate in Fashion Design from Baltimore City Community College and a BA from Stanford University. She is an active member of both the Association of Sewing and Design Professionals (ASDP) and the American Sewing Guild (ASG). She lives in Sparks, Maryland. See more of her work at sarahveblen.com. Everything you need to know to fit and adapt patterns so you can sew clothing that looks and feels just right.